The Crayola Glow Station is a glow in the dark drawing board that lets you create with light. The poster-sized canvas glows in the dark, and the battery-powered Light Wand is fun to use to draw with light on the canvas, which can be hung on a wall or used flat on a horizontal surface. The Crayola Glow Station works only in the dark, and the darker the room, the brighter the artwork created on the drawing board. When the lights go out and you put the Light Wand to the Glow Station, your child's drawing shows up in awesome glow in the dark images. Drawings made with the Crayola Glow Station disappear gradually over about five minutes, so the fun can begin again. Seeing the artwork fade is part of the fun and of the artistic element of the toy and encourages kids to keep making more designs for hours of fun. The Crayola Glow Station comes with stencils and textured sheets to help in creating more detailed designs and add more dimension to the artwork. The stencils create clear, bold glow-in-the-dark shapes such as planets and animals. The textured sheets let you add stripes, dots, feathers, and other cool light-up details to the drawings. 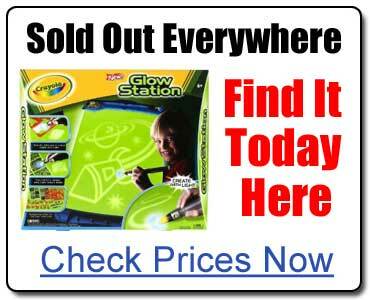 Find the Crayola Glow Station in stock and compare prices here before they're completely gone. Because the artwork made with the Crayola Glow Station is created by exposing the drawing surface to light, you can use all sorts of ordinary objects for cool effects. Add polka dots to your picture by shining the light through a strainer, for example, or get your friends to try to guess the mysterious object when you "draw" the outline of something by putting it up to the board and shining the light at it. The Glow Station comes with an acetate transfer sheet and dry erase marker. Use the marker to draw a detailed picture on the transfer sheet, then hold the sheet up to the Glow Station and shine the light through it and see your drawing come to life in glowing light. The acetate sheet wipes clean with a dry cloth, so you can use it over and over. Add an exciting new time factor to games like tic-tac-toe and hangman when you play them on the Glow Station, as you have to try to solve the puzzle or finish the game before the image fades completely. The possibilities are endless, as your kids use their imaginations to come up with new and different ways to use the Crayola Glow Station.